Do you have a ton of revisions but don't know what to do? Not often do I write a review but this caught my eye. You might recall that I briefly mentioned a couple of plugins in a recent post about WordPress Revisions eating up resources in your database. Obviously, the revisions feature is a necessity in a CMS like WordPress or any other. I love the feature and have had to use it on more than one occasion. There are sites that use it quite frequently and deliberately. But having a setting that allows you to decide for yourself, based on your individual needs, i.e. you are a writer or run an article site or magazine site, etc, or you rarely write anything, would be a great addition the arsenal of WP. Having used several database management plugins, I have discovered my favorite and just have to let people know more about it. Once you set this thing up, one click gets rid of all the extra revisions that fall outside your parameters in an instant. It even gets rid of transients, spammed items and unused tags as well as keeping a log file. For example, I had over 115 revisions on just one page in my site because I was testing out some new plugins and layouts, ah, thats kinda overkill on the revisions I think guys. Anyway, I digress, Back to the story, somewhere in a town in the Netherlands lives and works a man, a web developer, artist and partner in a web development company in Eindhoven called CAGE Web Design, Rolf van Gelder is his name. 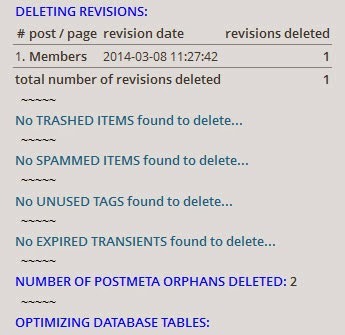 Rolf created a plugin called "Optimize Database after Deleting Revisions" (current version 2.7.7). I mean the name of this plugin just screams simplicity and it actually does what it says which deserves credit these days. The setup and settings are easy and give you good refinement on what you want to keep in terms of revisions. I only keep (2) revisions no matter what I am editing! It keeps the clutter down and a load off my database which is always good with a large site like mine. And as you will see below, it saved a ton of space in my database for MVM. Rolf thought of everything, it even lets you choose the tables and rows in the database you want to exclude or include, he did a really good job, KUDOS Rolf from the States! You saved me a ton of resources on my overloaded database and increased my caching and load time, both front and back while editing. If you haven't heard of this one, you might want to check it out. Its available through your WordPress Plugin Dashboard, just search for the name. 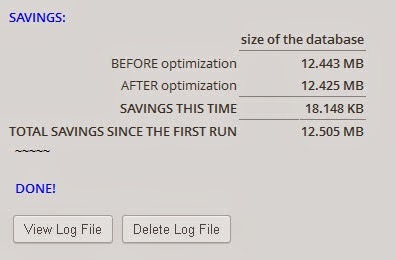 The "total savings since first run" in the picture below indicates how much total space this plugin saved out of my database allocated to "revisions"! 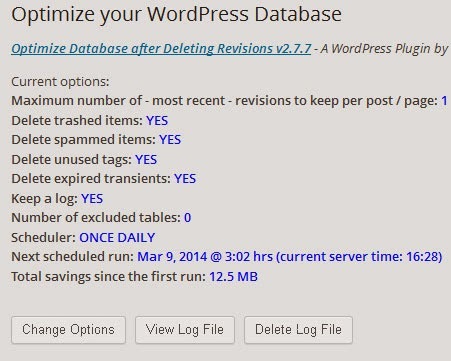 Twelve and a half MB is a lot for a database so just consider how many revisions you have since you upgraded WordPress, it could be as much as me or even more! Hello, please tell me what you think about the topics in my Blog. Thanks and have a great day! (C) 2013 - 2014 Allan Whitney (MindVisionMedia.net) All Rights Reserved. Awesome Inc. theme. Powered by Blogger.